Amazon.com Price: $80.20 (as of 2019-04-19 02:39:07 GMT) Product prices and availability are accurate as of the date/time indicated and are subject to change. Any price and availability information displayed on Amazon.com at the time of purchase will apply to the purchase of this product. 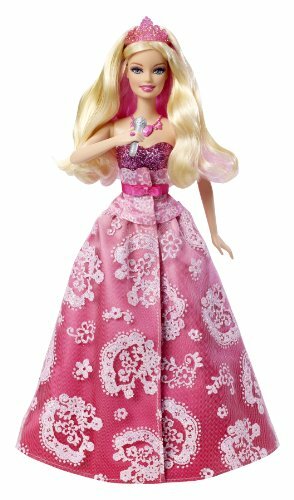 Barbie The Princess and The Popstar Transforming Tori Doll: Girls can recreate quintessential moments from Barbie The Princess and the Popstar with the Tori feature doll. Magically transform her from a princess to a pop star by simply pulling the string on the back of her long, lace princess skirt to reveal a fun pop-star dress and funky boots underneath. Then rotate her blonde princess hair to reveal a pink pop-star do. Press her necklace, and she sings. Tori doll performs two songs from the movie, a pink microphone is included. Doll cannot stand alone. Cloudb Gentle Giraffe Sound Machine just $16!